Has your kitty turned into an alarm clock? Getting the sleep you need each day is hard to do when your kitty wakes you with her loud whining. 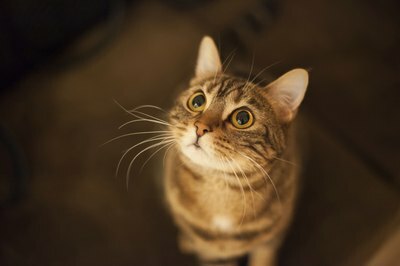 While some kitties may be seeking your attention or want you to feed them, others may be suffering from anxiety or an illness and require a veterinary exam. A cat that whines in the morning should visit the vet to rule out any illnesses or injuries causing this behavior. A cat that's in pain may sleep through the night, but experience discomfort upon waking, crying out because of it. Older kitties can suffer from dementia and confusion, seeking your attention because they become frightened or disoriented upon waking. Cats who suffer from hyperthyroidism will have an increased appetite and may constantly whine at you in the morning if their dishes are empty. A thorough exam will rule out any medical issues affecting your kitty, hopefully stopping her morning whining. If your kitty hasn't been spayed or neutered, she'll meow and whine constantly, especially when she first wakes in the morning, to be let out. She wants to go mate with cats outside and this behavior will continue whenever she's in heat for females and almost year-round for males. To stop this from occurring, have your little one fixed to put a stop to this and other unpleasant hormone-related behaviors. Cats are most active at dawn and dusk, according to PetPlace. When she first wakes in the morning, your kitty may become bored and want you to play with her. To get your attention, she'll whine and possibly even paw at you to wake you up. Responding to this by getting up and engaging her in play only serves to reinforce this negative behavior. Instead, engage her in play for 15 minutes before you go to sleep, Cats International recommends. This will tire her out so she'll sleep through the night and into the morning without waking you. Food can be a powerful motivator for your furry buddy and when she awakens in the morning because she'll be hungry for breakfast. If her bowl is empty, she'll begin to whine so you wake up and feed her. There are several options to avoid such issues, including filling her bowl before bedtime so she will have food ready upon waking. A gravity feeder stays full all day long and means she'll have her food at all times, including the morning. If your little one is obese, you may want to avoid such abundant choices and instead get her an automatic feeder instead. These devices have compartments that open to reveal her portions of food at preset times during the day, including the early morning hours. If your furry feline's whining is keeping you from getting enough sleep, you may have to put her in a separate room before you go to bed. This way, she can't wake you with her whining. An anxious kitty may whine in the morning due to stress and may need a prescription medication to keep calm. Consult with your veterinarian about putting your kitty on such anti-anxiety medications. Older kitties may be cold and whine to snuggle with you when they wake. Get your little one a heated cat bed to prevent this. Place her food, water and litter box within range of her sight so she has easy access to them and won't whine if she becomes disoriented or confused upon waking. PetPlace: My Cat Keeps Crying -- It’s Driving Me Crazy! What can I do?